In addition to mould and toolmaking our in house toolroom provides us with the ability to machine high quality engineering plastics, such as Machining UHMWPE. 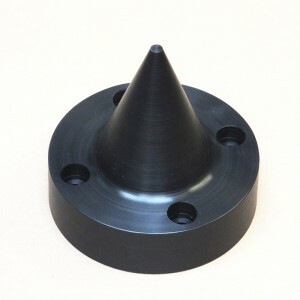 The images are of an industrial valve component, our capacity for machining UHMWPE parts means tooling charges are avoided, also parts that it would not be possible to mould or 3D print can be produced. The material used in this case is UHMWPE – Ultra High Molecular Weight Polyethylene. UHMWPE only becomes brittle at temperatures below −150 °C. Maybe not suitable for high load applications. A very tough material, with the highest impact strength of any thermoplastic presently made. What is UHMWPE used for? Because UHMWPE has excellent abrasion resistance it is often used for sand, gravel or aggregate process applications. These environments are incredibly harsh on any bearing material but UHMWPE is one of the few engineering plastics capable of withstanding such punishing abuse. UHMWPE can also be used for low friction pulleys because of its very low co-efficient provides a bearing medium that is very free running and exceptionally long lasting. It is often found in food production environments where high volumes of containers need to be guided along conveyors or production lines. Because it has very low moisture absorption, it is also found in some high demand areas of marine applications. It’s sometimes used in some cryogenic components due to its low operating temperature abilities. Because of its resistance to wear and impact, UHMWPE continues to find increasing industrial applications, including the automotive and bottling sectors. Since the 1960s, it has also been the most commonly used material for total joint arthroplasty in orthopaedic and spine implants. What are the machining characteristics of UHMWPE ? 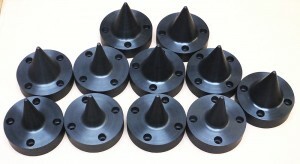 High speed steel tooling is recommended with lots of back rake, side rake and clearances, and a generous nose radius. Use caution when turning UHMWPE as the chips will be continuous and tend to wrap around the tooling so a “pecking action” is advised. UHMWPE does not absorb water readily, nor wet easily, which makes bonding it to other polymers difficult. Is UHMWPE good for food applications? Natural grade UHMWPE is FDA approved to be used in food applications. Does UHMWPE have good Wear resistance? UHMWPE is highly resistant to abrasion, in some forms being 15 times more resistant to abrasion than carbon steel. Its coefficient of friction is significantly lower than that of nylon and acetal, and is comparable to that of PTFE, or Teflon. Skin does not interact with it strongly, making the surface feel slippery, almost waxy. Why should you choose UHMWPE? This engineering plastic has an exceptionally low coefficient of friction which offers superb sliding properties and is one of the best materials for wear and abrasion resistance. It is tough even at low temperatures, it offers low weight, and is easy to weld. This engineering plastic can be machined into virtually anything, from small (low load)gears and bearings to huge sprockets-shapes that until recently were only possible with metals. It not only outperforms metal in abrasion applications, it’s also easier to machine and therefore cheaper. This versatile plastic can be milled, planed, sawed, drilled, and turned to create a huge variety of parts at a very competitive price. It possesses outstanding abrasion resistance, superior impact resistance, non-sticking and self-lubricating and excellent mechanical properties, even in cryogenic conditions.